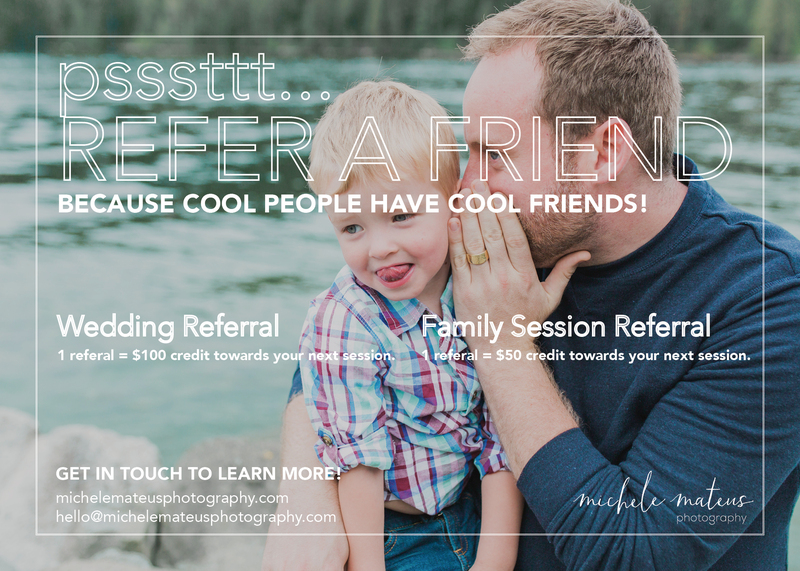 Michele Mateus Photography - Refer a friend and get rewarded! I am excited to launch my first referral program, inspired by all my amazing clients. Many of you have sent your friends my way and though I thank you with hugs I felt you deserve more, because let’s be honest, if it weren’t for you and word of mouth I would not keep meeting awesome clients! So how it works: You refer a friend and you get a credit towards a session! Pretty easy right? So now the details of what you get! For each Wedding referral I will credit you with $100 towards your next session of choice. For each Lifestyle Family Session referral (includes newborns) I will credit you with $50 towards your next session. A credit will be added to your client account once your friend has paid for their session. You can let your credits add up, and the more you refer the more credits you gain! The credits have no cash value and will not expire. Are you a new client that I am yet to work with and wondering if you can get in on this referral program because you have admired my work from afar and would love to book a session of your own soon? OF COURSE you can! Make sure your friend says who referred them and gives me your contact and I will ensure you have a credit ready for when you want to book! Many thanks and much gratitude in advance for any cool folks you send my way! Get in touch to book your session!